Visit Berlin does an amazing job of exporting Berlin as a premier tourism destination all around the world. 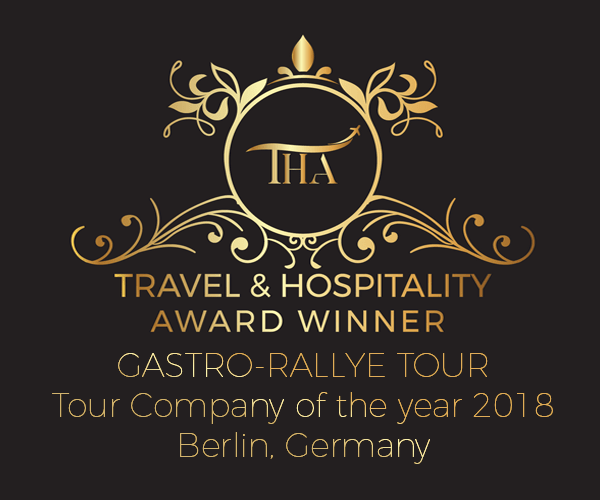 Berlinagenten partners with Visit Berlin when it comes to showing both journalists and travel industry professionals, the very best that Berlin’s gourmet scene has to offer with our famous Gastro Rallye’s. Visit Berlin, in association with the Taiwanese office of the DB Bahn were hosting 10 of Taiwan’s top media and tourist industry professionals. The group had been travelling around Germany for a week by train. Now it was a chance to see Berlin! Berlinagenten curated a programme that showcased Berlin’s amazing culinary scene at the city’s finest restaurants. On board for the tour was Visit Berlin’s Joyce Olivia Bernitt, who organises the programmes for incoming tour operators and Claudia Sult from the Visit Berlin Press Office. After being picked up by a luxury bus, we started our tour at Volt, where head Chef Matthias Gleiß interprets traditional Berlin dishes and German classics into a gourmet’s delight. Next, it was onto new French hotspot Restaurant Richard for our main course before we had dessert at the trendy Sage restaurant. By the end of the night, eight out of our ten guests had fully embraced the Berlin spirit and were last seen heading into Tresor Night Club, despite having an early morning flight home! Our mission was complete! Article posted in ON TOUR and tagged bars, berlin, Berlin Gastro-Rallye, bon vivants, culinary Berlin, culinary tours, fine dining, food, food tour, foodie, gastro-rallye, gourmet, guide, happening, hip, latest, Michelin-starred, new, private tour, restaurants, Visit Berlin on 27 March 2014 by Lollie Barr. Something is stirring in deepest, darkest Neukölln. Better known for its kebab houses than an innovative food scene, things are certain to change with the launch of the brand new restaurant Eins 44 Kantine. Tucked away in an art deco courtyard, you would never know this place existed. Yet after Berlinagenten tested out the menu, it’s guaranteed Berliners will be heading west and hitting the backstreets of Neukölln in the hope of seeking it out. Restaurant manager Jonathan Kartenberg and head chef Sebastian Radtke, were formerly at another one of favourite restaurants, Mani. The cuisine grounds itself in French basics, yet the exciting young team have updated it and then infused it with international flavours to create something brand new. For a new restaurant, we were impressed by the ambiance that makes this place feel like a familiar cozy neighbourhood eatery, but all the while being highly stylised. The two story building was originally a distillery, so there is a spacious modern, post industrial feel. Its original tiled walls, ceiling and impressive bar, acquired vintage lamps, wooden tables and chairs that date back 30 years combine together to create a very lived-in, cool atmosphere. Being Berlin, naturally smokers are accommodated in the form of smokers’ room, which features a massive wooden table on a turbine engine. We were certainly impressed by the food. To get our mouths watering, we started out with a gift from the kitchen, a dainty yet delicious mini Pork Belly Burger. First course, we decided on a delicious light crusted Golden Trout with granny smith apple and radish salad, along with a tender Beef Carpaccio with asparagus, grapefruit and a hint of coriander. For the main course, it was a speciality French pork done two ways, with a delightful cauliflower puree, and we also shared a perfectly grilled piece of prime entrecôte with potatoes and beans. Heaven arrived in the form of a 70% percent chocolate brownie cake with rosemary pineapple, mint and strawberry coulis for dessert. Now for the very good news, despite the quality and the ambience, Eins 44 is very reasonably priced. A three course meal costs 33 euros, four courses is 42 euros and five courses just 51 euros. Or you can buy individual courses. It is complimented with a fine French and German wine list. 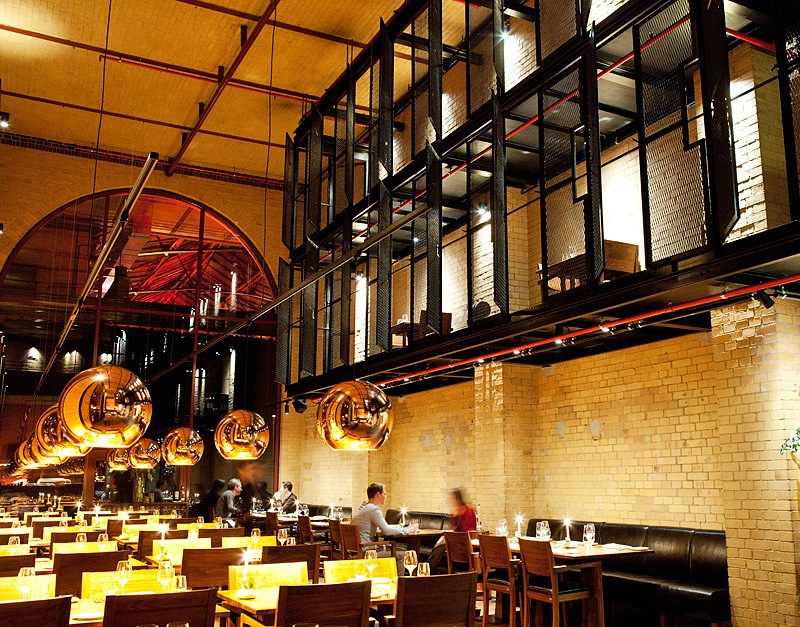 Eins 44 is definitely buzzing on our new Berlin restaurant radar! We honestly can’t wait to return. Article posted in THE SCENE, Uncategorized and tagged bars, berlin, Berlin Gastro-Rallye, bon vivants, culinary Berlin, culinary tours, eins44, fine dining, food, food tour, foodie, gastro-rallye, gourmet, guide, happening, hip, industrial design, Jonathan Kartenberg, Kantine Neukoelln, latest, Michelin-starred, Neukölln, new, private tour, restaurants, Sebastian Radtke, Visit Berlin on 27 March 2014 by Lollie Barr. Food can make or a break a visit to a new city. But how do you find the rare gems, the temples of gastronomy, the restaurants of the moment that crackle with an electric atmosphere? Well, you could always look online. However, chances are you’ll find a restaurant with good reviews but on arrival you find the waitress getting drunk on her own tears of boredom in an empty restaurant because the critiques were from 2011 before that regrettable food poisoning epidemic. Or you spend hours traipsing around aimlessly looking into restaurant windows trying to decide on where to go, then by the time you make your decision you can’t get a table. Even worse, you consult your guide book and find yourself in a restaurant full of tourists wearing bum bags and baggy track pants complaining loudly that the food is better back home. It was 10 years ago that Henrik started Berlinagenten after coming up with a very unique idea – the Gastro-Rallye. The idea being guests get to sample between three and four of Berlin’s finest restaurants in a one night. At each hand picked restaurant, you not only get to experience a different course but you also get pick on a different scene, a different vibe with the guarantee of fabulous food and atmosphere. What makes it so special is your personal guide. We pride ourselves on hiring well-informed guides with big personalities. You will walk off each course between restaurants as your guide gives you an insight into the local area, as well as fabulous insider tips that will make your stay all the more special. Due to Berlinagenten‘s contract with Visit Berlin, more than 1500 journalists have been on a Gastro-Rallye and we are constantly covered in print and on TV. Our clients include jet setters from New York’s upper East side, Hollywood types, corporates, bonding family groups, loved up couples, and everyone else in between. So it is no wonder that Berlinagenten has exported the concept to other destinations outside Germany. Check out the Berlinagenten Tour Shop for more information. Article posted in ON TOUR and tagged bars, berlin, Berlin Gastro-Rallye, bon vivants, culinary Berlin, culinary tours, fine dining, food, food tour, foodie, gastro-rallye, gourmet, guide, happening, hip, latest, Michelin-starred, new, private tour, restaurants, Visit Berlin on 1 March 2014 by Lollie Barr.